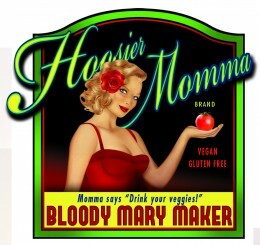 Hoosier Momma Bloody Mary Mix Featured In the Los Angeles Times! Indy’s own Hoosier Momma Bloody Mary Mix was featured in the Dec. 29 edition of the Los Angeles Times. In May 2011, the Times’ Chris Erskine visited Indianapolis and wrote a heartening story about his visit. The lowlight of his visit, though, was the Bloody Mary he ordered at St. Elmo. Being a first-rate establishment, St. Elmo responded to the criticism by replacing their mix with Hoosier Momma’s. Win-win. Erskine calls Hoosier Momma Bloody Mary Maker, “a mitzvah, a miracle of spiced tomatoes” and encourages his readers to order bottles for shipment. Lucky for you that you can get both regular and spicy versions of Hoosier Momma right here at Homespun. Congratulations to Erin Jones-Edds and K.C. Cranfill on their continued success! The 2011 Irvington Holiday Open House Is Upon Us! Come to Historic Irvington on Friday, December 2nd for carriage rides, caroling, food and drink, live music, pictures with Santa and of course a selection of goods from more than 150 handmade artists! The festivities will begin at 5 p.m. and wind down around 9 p.m.
Jarod and Shan didn’t set out to sell things, they just wanted to make unique lanterns for home decoration. 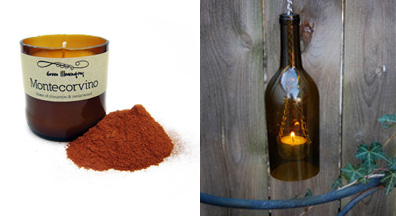 Green Illuminations products are made from recycled wine, beer bottles and recycled wine corks. Well presented and pleasant smelling, Green Illumination candles are a great way to green up your holiday entertaining! Jarod – 1. My real-life job is working at IUPUI as a student advisor. I advise students in planning days of service that range from 10-600 people. I also get to travel around the country and the world on service-based trips. 2. Over the past couple of years, I have really gotten into reading Tarot and Oracle cards. Anyone need a reading? 3. I have traveled to more than 27 countries. I was an International Studies major in undergrad and I love to travel. I get really excited when I have when I have the chance to experience a new culture. Shan – 1. I love horror movies, and the cheesier the better! 2. I wanted to be an architect when I was little until I realized the math that was involved. 3. I don’t eat fruits or vegetables. I’m a carnivore! People for Urban Progress also make a line of nifty shirts and posters to underwrite their larger project which are also available at Homespun. There’s a lot of things that we could say about the Jonas family and the products they make but we’ll just leave you with this clip from NBC’s Today Show instead.